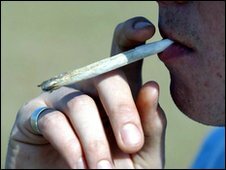 Two people have been arrested during a demonstration in Brighton calling for the legalisation of cannabis. Around 200 people held a rally in Victoria Gardens before marching though the city centre to Preston Park. Sussex Police said they had worked with the organisers to ensure the demonstration went peacefully. A spokeswoman said one person was arrested on suspicion of possessing class A drugs, and another for possessing class B drugs. The demonstration was organised on the social networking site Facebook. Protestors said they wanted to "enjoy a smoke without the hassle of being arrested".